A daring combination, but definitely traffic stopping sign for the 4th of July. 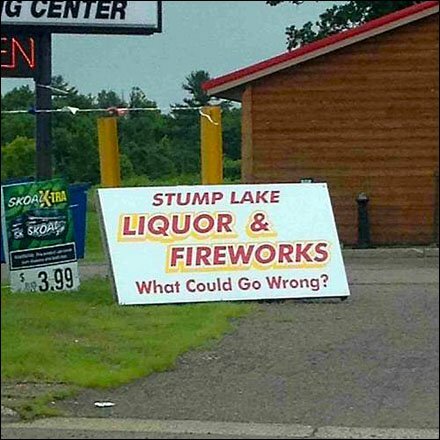 ” Liquor and Fireworks What Could Go Wrong ” the street-side promotion reads. But given the litigious state of modern society I would be sure to post a Lawyer-written disclaimer statement prominently inside BOTH store departments. I would also card every patron for age and identity, and maybe even have them sign a statement acknowledging the dangerous mix. A $1 million umbrella policy might be wise too.